Your favorite Brewers player might help you determine which beer to drink at Miller Park. Or it may not. 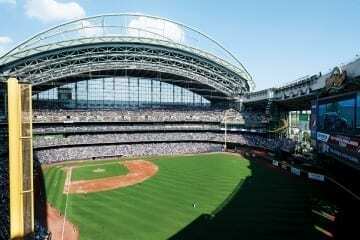 On Friday and Saturday, 40,000-plus fans will descend on Miller Park to root, root, root for the home team when the Brewers take on the Dodgers in the National League Championship Series. The ballpark features dozens of beer options. Do you have a favorite, a go-to beer at the park? If not, this highly scientific (or not) method can help you choose, based solely on your favorite member of the Brew Crew. Note: These beers are all available at Miller Park according to the handy MLB Ballpark app and/or my own personal research. Incredibly smooth and exciting. This ale frequently surprises you with just how consistently good it is. This beer is the MVB of Miller Park (in my humble opinion). And it helps make the ballpark a happy place indeed. Sure it’s an older style, but an Oktoberfest is perfect for the season. You don’t consider Oktoberfests much in the summer, but when fall rolls around they’re ready to play. This style isn’t flashy but it gets the job done when you least expect it. The pale ale is an outstanding representation of the style. It’s extremely reliable and has a low ABV, which makes it the perfect table setter to start the day (or an inning). It’s been there for you at the ballpark for a long time and has been a part of some big Brewers moments. Other beer drinkers may have decided to make the switch to new, trendier brews, but you stick to the one you know and feel comfortable with. It’s relatively new to the area but for some reason feels like it’s been around for years. It’s a perfect fit for the Milwaukee beer drinker. The citrusy brew exceeds expectations and comes up big in the clutch. This beer may be smooth but it can pack a punch with its 6.5% ABV. Keep an eye on this bold choice when you’re at the ballpark. It’s a Milwaukee original. A savvy veteran of the beer scene. It’s never a bad decision. You don’t necessarily have a favorite Brewer or a favorite brewer, but you like to mix and match. It’s a slightly unorthodox approach, but you are adept at putting beer combinations together during the course of the game that get the job done.